They can link up remotely with a robot avatar, which interacts with the world on their behalf. The robot feeds them sensory input, and they control it, to a point where their experience of the world is similar to that of a human - except they have the internet more or less built-in, so they can access information internally, make voice calls to others without making a sound, and control how much pain they actually want to feel if the robot gets damaged. These avatars are called Threeps (after C-3PO), or, derogatory, clanks. A tiny number of people had a different side effect from the flu: their minds have become open to let others in. So the locked-in can, if they have the cash, download their own minds into a real human body, and experience the world through a human avatar. However, the owner of the body is never entirely gone, and can take control back, and this is much more expensive than using a threep. There is a virtual reality just for Locked In people, called The Agora, where they can meet, interact, and have their own personal space. Our hero, Chris Shane, is one of those locked-in people. (They're called Hadens in the book, as their condition is called Haden Syndrome, after the US president whose wife got the condition while he was in office). We start the story on his first day working for the FBI, joining another agent to form a team of two focused on Haden-related cases. It's also a day of a Haden strike, as the government is changing the subsidies and funding for Haden sufferers (threeps are, after all, not cheap). The world is introduced in a clear, concise infodump, right at the start. Basically, before the story starts, we get a school text book revision notes of the history of Haden's Syndrome, and within two pages or so, we know pretty much all the background that's needed. The rest is revealed casually and deftly, but easily accessible. It's not the sort of scifi novel that throws you in at the deep and and enjoys your disorientation. The story is, of course, a whodunnit. Along the way, we learn more about the world, more about the different perspectives (of Hadens about others, and of others about Hadens). Characters occasionally discuss politics and change and what should or should not be done for Hadens. Should there be work to 'cure' the condition, or should all efforts be about enabling people who have it to function without physically altering them? It's a debate that reflects one about deaf culture (should there be more work aimed at enabling deaf people to hear, or more recognition of sign language, lip reading and deaf culture as just one different culture living in a multicultural society, with efforts to enable deaf people to live independently and successfully among us, but no efforts to make them hear the rest of us?). Lock In is a novel with simple, straightforward prose, clear dialogue, people discussing things - it is not a book that dazzles you with style, but it is a book that draws you in with ideas. One very obvious thing is that it doesn't present the locked in characters as victims. They may have some vulnerabilities, and they may have been badly afflicted when the condition first arose, but by the time of the story, they have successfully become fully functioning citizens. Our hero is rich, his threeps are ultra-modern models, and he isn't shy to download himself at a moment's notice into a borrowed threep in a different part of the country, or use his internal gadgets to record video and audio and 3D scans. He is living in his parents' mansion, but looking to move his threep into a flat share with other threeps. Some Hadens might have to survive with unreliable threeps, parked in depressing wardrobe-like boxes to recharge, but that's a rich/poor divide, not an inherent victimhood. And just as the Hadens aren't victims, but highly capable individuals who can be very empowered by technology, they are also mixed people. Our hero is smart, brave and good, of course, but we also encounter firebrand campaigners, selfish egomaniacs, and at the very heart of the murder case, a cold-blooded murderer. Hadens, in short, are people. Good people, bad people, rich people, poor people. Some aspects of their lives are quite different from the rest of us, but in a way those are mere logistical matters. (Perhaps that is all 'culture' boils down to: the logistics of interaction - the rest is just humanity). I enjoyed reading Lock In. It's thoughtful, engaging, and entertaining. Some things are never really expanded upon to the extent I had expected (I had expected more things about / in the Agora), and there are never really enough suspects in the story (it's not like those TV crime shows, where every character would have a motive), but it's a thoughtful book packing complex ideas into an entertaining whodunnit (without telling us what to think). I really, really need to get to reading this as soon as I can. 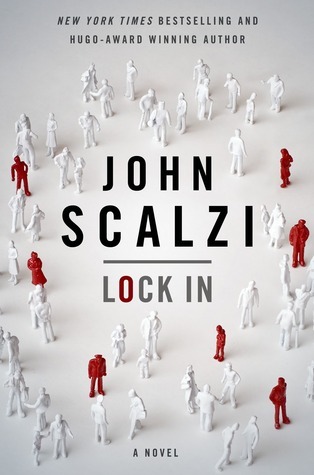 I normally enjoy Scalzi's work, and it sounds like Lock In has some really interesting themes. Plus, it's coming up in one of my online book clubs.